The recent inaugural gala at the Mindspring Gallery, located at the corner of South Main St. and Canal, was a fine reception, complete with sumptuous spread and live music performed by the Ambassadors of Light, a jazz trio including Eugene Uman, Claire Arenius and Jamie MacDonald. The Gallery, which is evidently concentrating on the presentation of "computer art," is the newest professional venue in the rapidly expanding downtown art scene. Its windows look out onto the town's main thoroughfare, Canal Street (Route 5), which leads down into Main St. from the South (Exit 1 off Route 91). Nearby is the Brattleboro Museum & Art Center, which hosted a shoulder-to-shoulder artists' reception last month. Mindspring is ideally situated and has expanded the art district in two unexpected directions, both onto lower Main Street and into the digital world. The five artists in the gallery's first group show included two non-computer artists whose work actually complemented the computer art and placed it in a broader comparable context. The digitally generated work of director-curator M. E. Stanton was featured and complemented with images by her teacher and mentor, Dorothea Kehaya. These were computer-enhanced scans made from original "C" prints. Dave Younger's moving fractals were visible on a Sony WEGA Trinitron big screen. And simultaneously, acrylic paintings and prints by Holliday and small maskish ceramic sculptures by Dan Gehan were present. M. E. Stanton's presentation was dominated by a group of surrealistic aquatic scenes which depicted natal forms, such as pyramids, orbs, diamonds, eggs, transparent donut rings and in one case, a small, standing, clear section of checkerboard. In Ocean Explosion, three such forms float on and rise above the rippled surface of an expansive body of water. On the left, a stunningly clear transparent orb ocularly bends the aqua horizon and reflects the sun. At center, the clear orb has stretched, bubblelike, into a taller form containing a transparent rainbow donut ring emerging from a heavier leaden orb bobbing beneath. The metallic sphere has a shiny creeping mesh, like dripped mercury, on the surface. That silvery substance has leaped up, at right, into a third diamond like form, a sort of levitating inverse splash. These three primal shapes seem to loom, and stare, at the viewer. Metaphoric and surrealist-symbolist thought is undeniably present. The piece exhibited immediately to the right, entitled Universe Dancer, seemed related. In this piece, the water horizon is minimized to strips of salmon and aqua, and the diamond form appears alone, centrally hovering. The iconic, flamelike diamond is now two-dimensional, having lost its transparent and chiaroscuric characteristics. It has become an expressionist bouquet of color splashes and simulated brush strokes. This shows how the computer artist may change centuries with the touch of a key, at least in terms of spatial orientation. In a series of small works entitled Portals 1-2-3, and in a large ink-on-paper piece of glowing yellow called Egg Clear, Stanton used the computer's ability to recreate diffusion effects, recalling the paintings of Abstract Expressionist Mark Rothko. 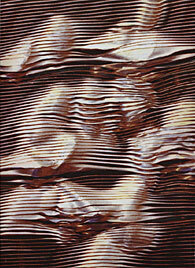 Dorothea Kehaya, now 80, was an early abstract photographer. Her portfolios are included in collections at the Library of Congress and the Metropolitan Museum of Art. Her work applies principles of abstraction, put forward in painting, to the medium of photography using scenes and textures taken randomly from the environment. Her computer images, unlike her student Stanton's, are not generated by the computer but enhanced by it, after being scanned from her photographs. Carravaggio's invention of dramatically expressive light in darkness may be experienced in Two Pears, a small still life with a northern European flavor. In Bus Stop in New York, a floating sphere over a horizon line, found as aspects of a section of masonry, recall Adolph Gottlieb's similar juxtapositions. 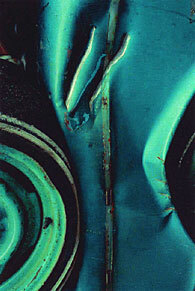 The photograph used in the piece Metallic Reflections might have been taken of a section of a crushed air conditioner or perhaps a smashed radiator. A pattern of vertical stripes fills the horizontal rectangle like the side of a zebra, the wind through tall grasses or the slashes of Italian artist Lucien Fontana. Minimalist graphic design is referred to in Barn Door and Window, a photograph with computer-enhanced expressive color. The prints by Barbara Holliday, shown alongside original acrylic paintings, provided a good comparison of process pre-digital and digital for the viewer. 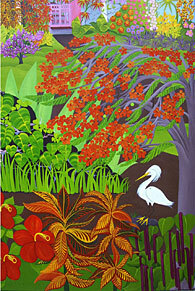 Holliday's painting style is very reminiscent of the "naif," flat, child-like style of Henri Rousseau. She uses matte planes of solid color in depictions of simple cottages or houses in rural settings from snow-covered winter to flower-drenched tropical gardens. All of Holliday's worlds are Edenic, celebrating the rich color, abundant variety, and tenacious will to live, of nature. The apparent joie de vive is immediately assimilable in Holliday's rendering of the alizarin door on a grayed cedar-shingle cottage or a white New England seaside porch and the flowers, flowers everywhere. The earthy and culturally eclectic ceramic works of Dan Gehan featured the repeated central motif created by casting a Buddha head obtained by the artist in India. The palm-sized ceramic heads are embellished with folds of clay suggesting cloth or garments. They are also "programmed" with different textures and color. Like an image scanned into the computer and then produced in different states of generated effect, the Buddha head acts as a conduit, contextually transforming into differing entities. The textures are created by pressing patterned surfaces into the clay, while acrylic paint is used to apply the bright but subtle color. These works are the perfect precious object for a for a reflective corner, indoors or outdoors. 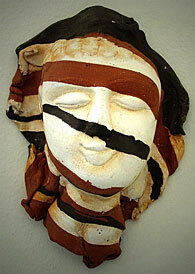 Head #1 had jester and shaman qualities and was actually made by laminating stripes of red and white clay. A butterflylike cowl enhanced the vertically layered face. Head #3 had a sunny landscape incised on the visage, while clouds spread onto the hat, suggested in delicate graphite. Head #4 was colorfully decorated with floral forms on yellow. Computer artist Dave Younger had a fantastic display of his computer-generated moving fractals, which will be ongoing at the gallery. Watching these undulating forms, writhing at the speed of a lava lamp, seems to transport the viewer immediately back to the sixties, via the Starship Enterprise. Younger's pieces are sold as DVDs. In extended visual experiences entitled Wormhole in the Wall; Tunnel in the Twist; and Potpourri, you'll wonder what was in the punch. This is your mind on Dave Younger.